Testing products with representative users is a key factor for user-centered design. 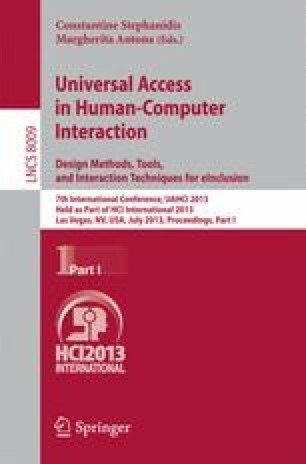 When such representative users are disabled children the user testing process becomes a challenge and in this case evaluation methods based on heuristics and inspection could not attend the final user needs. The major purpose of our research is to provide an evaluation method that could measure disabled children interaction. This work first discusses the development of the coding scheme based on the detailed video analysis method which was adapted to observe interaction of children with Down syndrome. After that we demonstrate the method reliability by applying the cohen’s kappa coefficient and the any-two agreement measure. Finally we discuss how this method could be used to evaluate usability and fun problems.